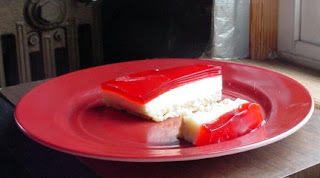 Another Aussie/Kiwi recipe we tackled this week is a layered dessert called Jelly Slice. I found a recipe a Joyce's Fine Cooking Blog and played around with it to make a gluten-free version. We had some wild flavors of jello laying around from the Youngest Girl Child's recent science homework project, so I substituted cranberry jello for raspberry and I also had no lemons around, so used limes for the middle layer. The result, a probably more tart version of this dessert, but one reminiscent of the Sea Breeze Cocktail, was pronounced delicious by one and all. Dissolve cranberry jello in boiling water. Let cool. Crush cookies in food processor until they are fine crumbs. Mix in melted butter. Press into a 7x11 (2 quart) glass baking dish and place in refrigerator to set until firm (about 10 minutes). Dissolve unflavored gelatin in boiling water. Add lime juice and condensed milk. Stir to blend. Pour over cookie crumb crust once it is set. Let middle layer chill in refrigerator until set (about 45 minutes). Gently spoon cranberry gelatin on top for the final layer. Cover with plastic wrap and chill in refrigerator until set (1-2 hours).